A testament to the comforting power of an animal's love. The uncomplicated love and dedication of a dog can make anyone feel better--particularly a child who is small and vulnerable. 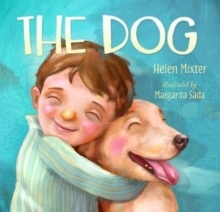 Through beautiful, simple illustrations and words, The Dog shows how one animal helps a young boy who is ill.
She is his comfort, his companion, and his friend; when he's unhappy, she places her paw on his hand to show him she's there. The Dog is a story for young children, and for anyone who has ever owned a pet. But most of all, it shows how important animal companionship is for children. The warmth of animal friends helps make life worth living, especially when times are tough.